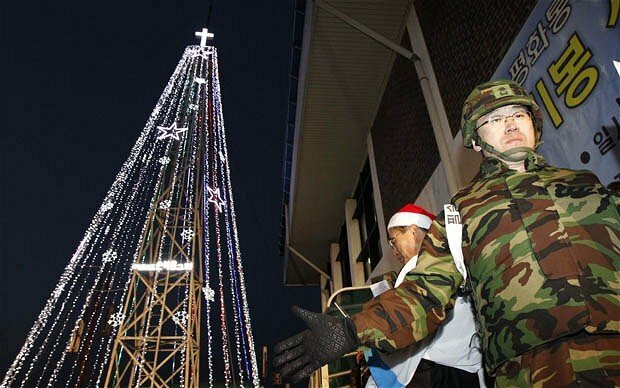 South Korea has taken down a tower used to construct a Christmas tree at the border with North Korea. The ritual, in which the 60ft tower was covered in colorful lights and topped with a cross, was seen by the North as propaganda by the South. North Korea repeatedly demanded its demolition and threatened to shell it. The move came a week after senior military officials from the two Koreas held talks for the first time in seven years. Two weeks ago, the two countries briefly exchanged gun fire across their land border, in a rare incident. Gunfire was also exchanged recently when a North Korean patrol ship crossed the disputed western maritime border. The tower, which stood about 2 miles from the border, could be seen by North Koreans living in nearby towns. Citing a defense official, South Korea’s Yonhap news agency said the tower, built in 1971, was being removed because it could collapse. The official refuted speculation that the demolition had to do with relations with North Korea, and said the tower had been awarded a low grade during a safety check. In 2004, South Korea stopped allowing groups to erect the Christmas tree after dialogue with North Korea in which both sides agreed to stop propaganda activities by the border. However, it allowed Christian groups to put up the tree in 2010 when a South Korean warship was sunk by, Seoul says, a North Korean submarine. News of the tower’s demolition came as North Korea freed Jeffrey Fowle, one of three US citizens currently detained.